I am a sweet tea drinking gal, that’s just the way it is. I am in the South and it is an unwritten rule around here that you are weened off your bottle onto your momma’s sweet tea. Okay maybe it’s not quite that early but it is a staple in many households. I love my tea- tea moments relax me-but sometimes I just want something a little different. So, I set out to make a refreshing drink for the hot summer days down here. I also love the flavors of Mojito but rarely imbibe so I thought that I could make a similar flavor profile in a mocktail, enter the delicious “Tea” jito. 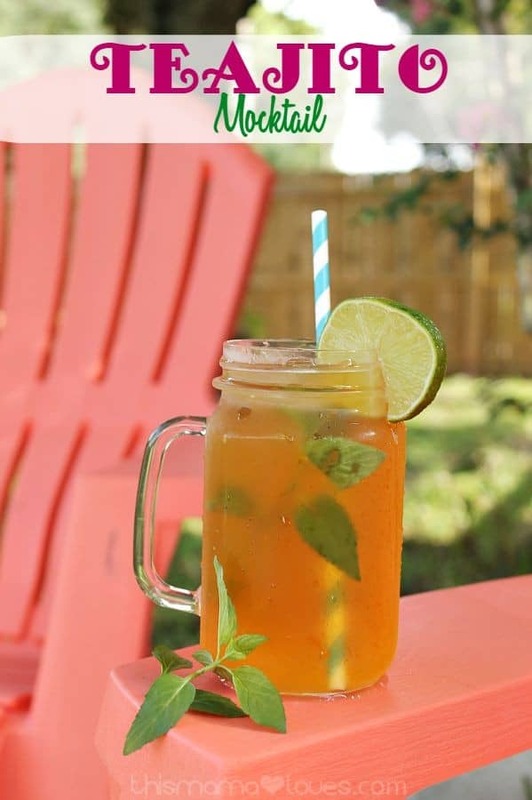 Sweet and minty with a citrus punch that makes it wonderfully refreshing! Sound good? 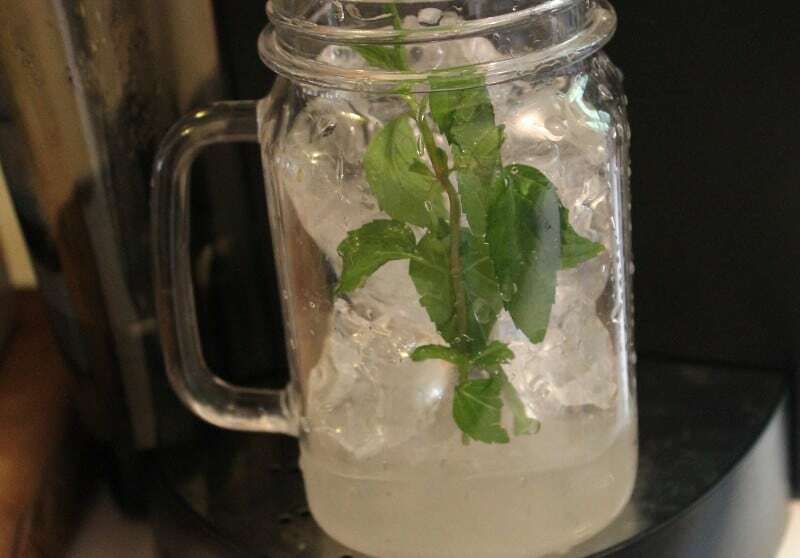 Here is how you can make your own in a snap…a simple Teajito Mocktail recipe. You may also enjoy our rhubarb tea recipe! 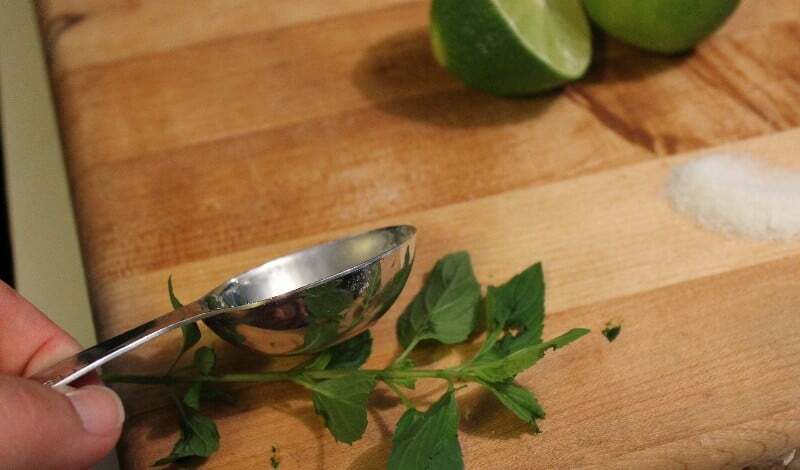 Tap mint gently with the back of a spoon to bruise leaves and release the flavor. Prepare tea as directed, brewing right over your other ingredients. Stir well to combine flavors. Add a slice of lime and a sprig of mint to garnish. 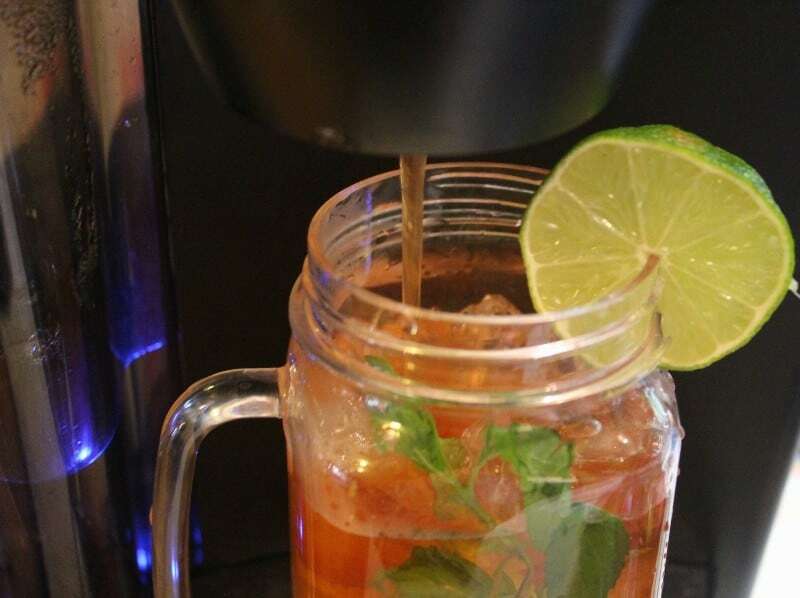 Do you make beverages like our teajito mocktail? I like the 50% Orbit Gum individual packs. I like the 15% off the hampers. My favorite is the 40% off Hillshire Farms Smoked Sausage. The 50% off of Orbit gum, What a great deal. My current favorite deal is the 30% off Kaspersky Internet Security. And surely it has nothing to do with my current program running out tomorrow lol. FYI – Your Pin Links for entries in the rafflecopter are not working. My favorite discount is 40% off Starbucks Iced Coffee. I like the 5% off Lipton Tea K-Cups K-cup varieties! I love the discount on Kleenex’s.. just in time for school! I’d use the 20% off gaiam yoga stuff! 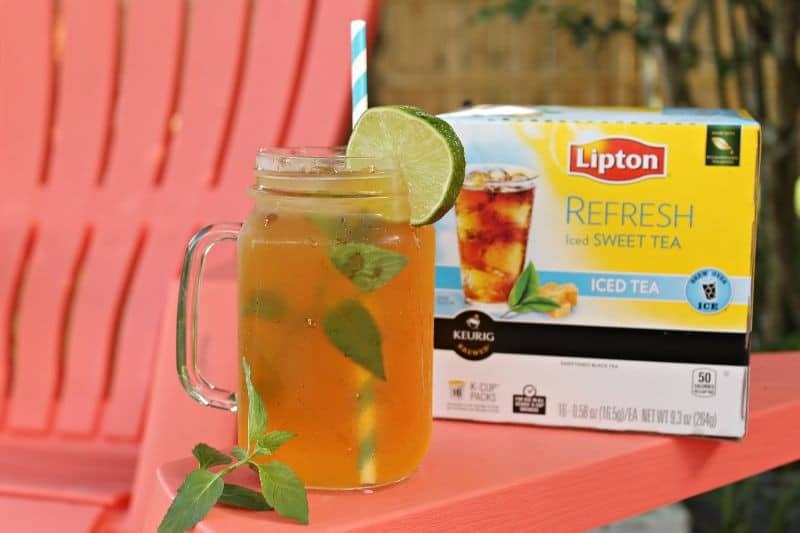 5% off Lipton Tea K-Cups – yum! I love the 5% Lipton Tea K-cups. I like the 5% Lipton Tea K-Cups. 5% off Lipton Tea K-Cups–use it all the time! I like the 15% off Tyson frozen breaded chicken. I like 20% off Smith and Hawken decor. 20% off Schick disposable razors. My favorite discount is 20% off the Nestle Pure Life Purified Water. 25% off Lipton 12 packs offer. My favorite discount is the 5% off discount on Lipton Tea K-Cups. Mine is 5% off lipton tea cups. 5% off Lipton Tea K-Cups. Cartwheel always saves me money. My favorite offer right now is 50% off Orbitz gum. 25% off Tyson’s chicken–we eat a LOT of chicken!! What is showing is the Lipton Tea K-Cups offer. 5% off fresh berries!! Our family LOVES all kinds of berries and we go through them so quick. 50% Reynolds Cookie Baking Sheets is my favorite. My favorite current discount is 5% off Lipton Tea K-Cups. I like the 5% back on Lipton kcups. 5% off Market Pantry milk. I love that right now they have 50% off Orbit Gum! 5% off Market Pantry Cheese. My fav is the 25% off Lipton 12 packs offer. I like the 20% off Johnsons No More Tangles products. 5% off Lipton K-Packs looks like a good deal. 15% off Oreo Cookies Family Size. I like 15% off Oreo Cookies Family Size. I like the 25% off Lipton 12 packs offer. I like the 5% off potatoes. This looks so yummy! I never knew you good make iced tea with a k-cup. Great post! Thanks for sharing at the Home Matters Party. One of my favorite discounts is the 5% off Market Pantry Cheese shredded, block & deli because we eat a lot of cheese in our home. My favorite is the 20 percent off kids clothes. I like the 20% off kid’s apparel. 20% off kids appearal is my favorite offer! I use the 5% off Coffeemate often. Loving the 25% off of Naked Juice! I love that Cartwheel almost always has a 5% discount on milk!! Oh we would use the 10 percent off General Mills Cereal! The 5% discount off Lipton tea. I like 5% discount off Lipton tea. I like the 5% off the Kleenex since we use so much of it. i like the 25% off Naked Juices. I like 20% off Kraft Macaroni & Cheese. I like the 5% off Lipton k-cups. I recently got Duncan Hines cake mix $.48 a box. They were on sale for $.88 box,plus I used a $.40 off a box! Great Deal!! My current favorite discount is the 15% off Circo School Backpacks. My current favorite discount is 5% off Clorox Wipes. Definitely love the 5% off Lipton Tea K-cups! The 5% lipton and the 30% off Annies snack! I love the 20% off all kids apparel!! 5% off Lipton Tea K Cups! I like the 25% off clearance shoes for family. They’re offering 10% off all Essie nail polishes and spa treatments right now! I’m happy to find Lipton Tea K-Cups K-cup varieties -5% off!! I like the 15% off Circo Kids’ Socks Tights. My current favorite discount is 30% off ziploc bags! We would get the most use out of the lipton k cups. I like the 5% off Kleenex tissues. The two pin buttons don’t find the pictures. I found both by searching your blog, but you might want to fix them. My favorite discount is 5% off of milk. I use it every time. I could use the 5% Lipton Tea K-Cups offer. I like the 20% off the Rubbermaid Lunch Blox Kits. Although, if I have to use my phone in the store I won’t be able to. I don’t have time to stop and fumble around for my phone. 5 percent off Lipton T K Cups. 5% percent of lipton tea would be great! I like the 20% off the Rubbermaid Lunch Blox Kits. It would be perfect for school. thank you! I like the 5% off Lipton tea kcups. Ive never used cartwheel. My favorite discount is 10% off Burt’s Bees. 5% off Lipton Tea works for me! I like 20% off Microwaves. 5 % off milk is a great discount on something I buy all the time anyways! Love it! I like the 10% of general mills cereal. I’ve been looking for workout clothes so the 20% off Men’s and Women’s C9 Champion is perfect! I like the 5% off Lipton Tea K-Cups. I like the 40% off the Coleman Fast Pitch Tent. I love the 5% off milk for my twins! My favorite discount would be the 10% off General Mills Cereal. I like the 25% off of Hefty trash bags. The 20% off Mr. Sketch markers, I love those things! 5% off LIpton K Cups are up my alley. Save 20% on Mossimo Supply Co. women’s cardigans! My favorite is the 5% off Market Pantry Milk! I use that all the time! This is exactly what I need right now. Sounds very refreshing! This does look refreshingly delicious – I should it give it a try! I like the 10% off General Mills cereal discount. I like the 5% off Market Pantry Milk. My favorite coupon is the one for 25% off clearance shoes for the family! I’ve been a fan of Lipton Tea since I was young. I like the 5% discount on the Lipton Tea K-cups. I would definitely like to try the K-Cups with Lipton Tea. My fave discount is combining cartwheel with my Target card discount (and if I’m lucky, a manufacturer coupon too)! Since I am a senior my favorite discounts come from AARP and there are a lot of them. Very handy when you are on a fixed income. This looks SO refreshing. I love adding mint to my tea. One of my fave deals 20% off thinkthin protein nut bars. I put mint in nearly everything! I am obsessed. I really love adding mint to water or tea! That looks yummy and refreshing. Perfect on a hot day like this. I love tea and I love mint so I will try this recipe for sure. Sounds delish! I have never made tea like this before. I will have to pick up what i need to make some. It looks so delicious. The colors in this drink scream summer! I’m not much of a tea drinker, but this still looks amazing! Ooh this drink sounds good. I have to pick up some Lipton K-cups now. My daughter uses my Keurig for coffee but I only use it for tea. That looks refreshing! I love fresh mint and sweet tea! My favorite discount would have to be the Embark camp chairs. This looks delish. I love that is alcohol free, so it could be made for everyone to enjoy. I hear you on the sweet tea thing! I think I may have gone straight to a mason jar of the stuff when I was just a babe! This is a refreshing drink that I cannot wait to try. A drink like this makes me want to grow fresh mint in my garden. I also love tea so this drinks works. Adding in the mint is what captured my eye! Drinks with mint in them are so refreshing! The Lipton K-cups are so handy and taste so good. They are my new go-to for delicious tea! I like the 10% off Neutrogena Cosmetics deal. Looks refreshing. Would be nice on a hot summer day. My mom is also a big sweet-tea fan and I definitely want to share your idea with her. That sounds awesome. It’s light and refreshing. Great summer drink.